Will You Make a New Years' Resolution? Will You Make a New Year’s Resolution? 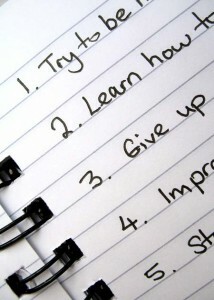 If you’re going to make them, now is the time to put those New Year’s resolutions down on paper! Dude. Where did the year go? We can’t believe we’re just two days out from the New Year. Insano in the membrano. And you know what New Year’s means right? Time for us to make those resolutions—or not. While we FBGs will each be doing a post next week on what our New Years’ resolutions will be (or why we’re not making them), we want to pick your brains on this topic now. My answer isn’t on that poll list 🙁 Why? Well if there’s a goal I want to achieve, I’ll set it straight away, why wait until New Years?! Although, I will have a list of stuff I want to achieve in the next year, but they’ll just be expansions of previously set goals.. I have a lot planned for 2013, but I resist “officially” having resolutions because (a) I feel it’s a bit cliche and (b) it seems to be a bit of a jinx. For instance, I’m itching to do my first Whole30 program, but I refuse to start on January 1st (waiting until the 6th instead).